Wilson youth baseball gloves are intended for a younger, more advanced ball player who is looking to take their game to the next level. For the 2018 season, the A900 series is just what the doctor ordered to help get an edge on the diamond. Each model offers a cool, old-school look with the dark brown, full leather construction that comes game ready with absolutely zero break-in period. If you're sick and tired of having a sore wrist and knuckles from an extensive break-in, the A900 is just what you need. From day one, these baseball gloves are ready to go when you are. Plus, Wilson has applied their double palm construction on the front side of each design to help add extra stability and a low profile heel that allows for easier closure and less rebound on bad hops so that you can turn two without fail. Wilson: The Players' Choice! 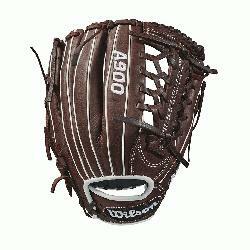 This Wilson A900 youth baseball glove (WTA09RB181175) features a popular 11.75-inch pattern, a pro laced T-web, and a conventional open back that offers a classic look. 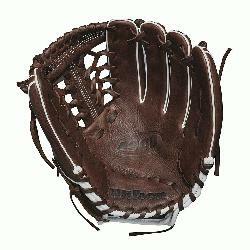 No matter if you're an infielder or a pitcher on the mound, this model is right for you. Don't forget, we're here from click to catch!.